3mm Speedplay LL Shim discrepancies with Speedplay cleats. Speedplay-compatible Leg Length Shims (LL Shims) are used to compensate for leg length discrepancies with Speedplay cleats. Speedplay-compatible Leg Length Shims (LL Shims) are used to compensate for leg length discrepancies with Speedplay cleats. This 3 mm thick LL Shim is made of high-density plastic to conform to the curve of the sole of the shoe. 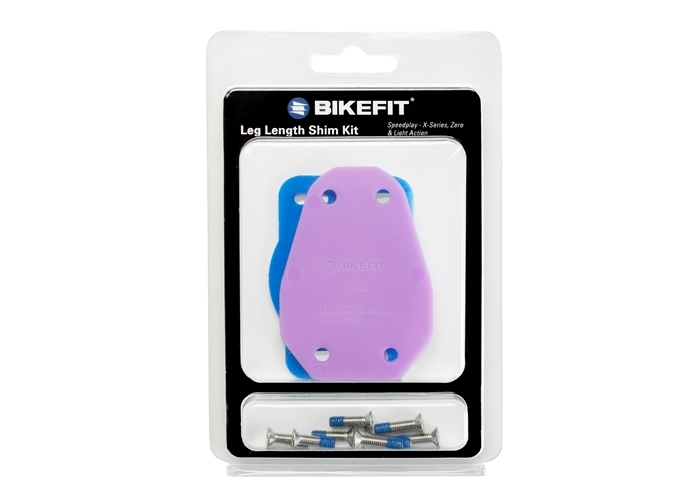 The package includes one (1) Speedplay-compatible Leg Length Shim, four (4) 14 mm, four (4) 16 mm screws and two (2) Speedplay Cleat Wedges (which can be "stacked" to create an additional 1 mm of height). Please note: these screws DO NOT work with Walkable Cleats. Multiple Speedplay-compatible LL Shims (sold separately) may be used together.